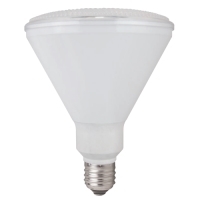 TCP LED17P38D27KNFL 17W Dimmable Designer 25Deg PAR38 LED 2700K 120 watt equiv. This dimmable energy saving LED light bulb from TCP Lighting is part of the Elite Designer series. It is designed to replace an incandescent PAR38 without anyone even noticing. It has a 25 degree beam angle, and consumes only 17 watts of energy. With a 1200 lumen light output, it provides enough light to replace a 120 watt incandescent bulb. The 2700K color temperature produces a warm white glow. This 17 watt PAR38 has an average lifetime of 25,000 hours.